In 1619, when Sir Robert Rich ordered his Galleon Warwick to sail to the American Colonies with a load of much needed supplies, he may have had more than merchant work in mind. Sir Robert, the Earl of Warwick, was a major shareholder in the Bermuda Company. Although his stake in the joint-stock company was intended to be an important source of income, Sir Robert involved himself in privateering – legal piracy – on the side. Warwick was a sturdy, well armed merchantman. Although she was a supply vessel, she had to be capable of making long voyages alone through potentially hostile waters. However, the little vessel may have been armed for more than self defense. 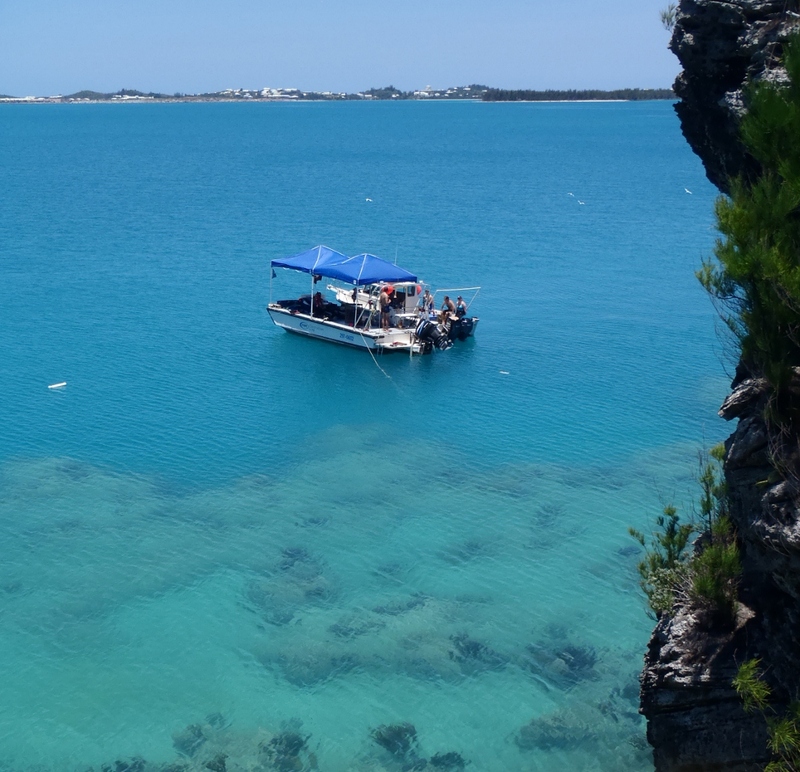 Warwick sank in 1619, in Castle Harbor, Bermuda. It was a hurricane, and not battle, that brought the end to the robust English Galleon. In November 1619, a fierce northwest wind whipped across the island of Bermuda. Although her crew had cut down her mainmast, the wind was too strong. Warwick slipped her anchor wand and was dashed upon the reefs. 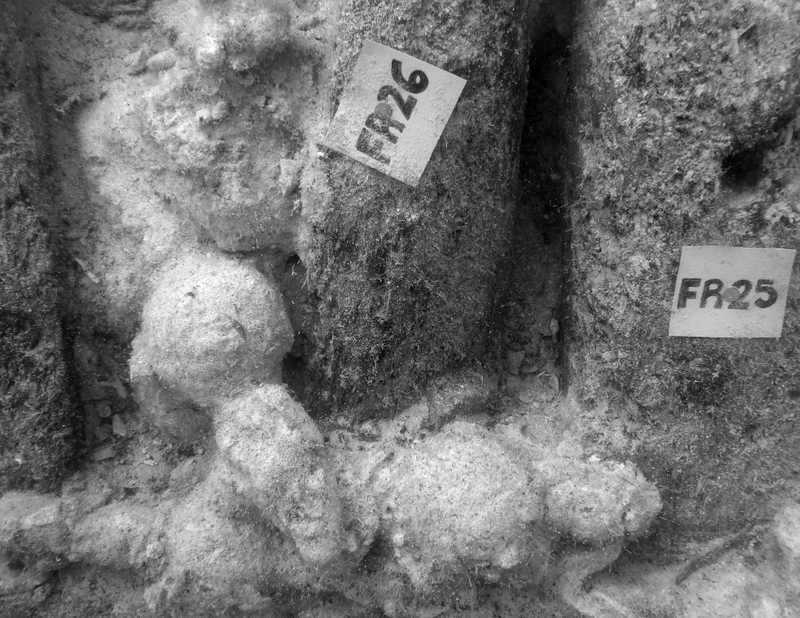 Four hundred years later, excavation of the shipwreck is revealing a number of exciting clues about the nature of the vessel. I have been part of an international team that has be working on the wreck since 2008. One thing that impressed us about the 2011 field season was the variety of ordnance we found aboard the ship. In addition to cannon balls, we found spiked shot, as well as bar shot and expanding bar shot – both designed to de-mast and disable other vessels. Was this offensive armament standard for merchantmen at the time, or was Warwick prepared for more than just evasion? Today, Warwick rests on her starboard side; everything above the level of her main deck is gone. When she went over, loose ordnance rolled across her deck and piled along her frames – as you can see bellow. When iron corrodes in salt water, the pH changes and calcium carbonate begins to precipitate out of the water. It mixes with shells, minerals and sediment, forming a hard casing around the metal; this is called a concretion. The metal is still preserved within the encrustation for a time, though it continues to degrade. If enough time passes, the iron may corrode into a stinking, black sulfurous mush. In the case of Warwick, some of the encrusted cannonballs and spiked shot are in good condition (this is verified by x-ray). 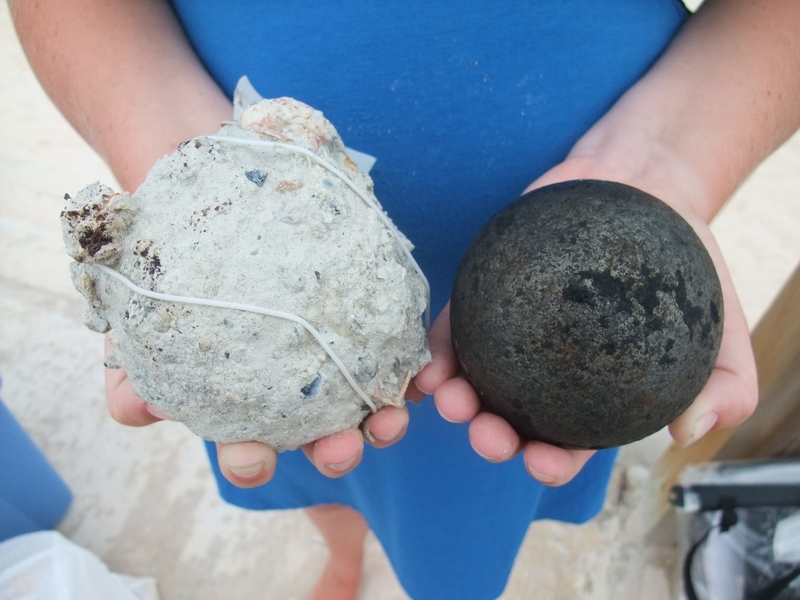 A trained conservator can carefully break open the concreted shell and extract an intact cannonball, as seen below. These iron objects are highly unstable, and must to through a process called electrolytic reduction to prevent further corrosion. This summer we are returning to Warwick for another field season to excavate what is left of the hull. After the storm of 1619 fell away, locals stripped what they could from Warwick’s hulk. What they could not hide was confiscated by the Governor. The goods aboard belonged to the Virginia Company, and Governor Nathanial Butler did everything in his power to reclaim them from the would-be salvagers. Following the winter, the Governor ordered a diving team to recover whatever was still trapped in the wreckage, netting three cannons and several barrels of beer. They raised five more cannons in 1621. The eight salvaged guns were integrated into Bermuda’s defenses, and a number were sent to the new Fort at Southampton. From there, they vanished into history and have never been relocated. Raising the cannons was an arduous task. Seventeenth century salvage divers had to rely primarily on their lungs, the guns did not come easy. Much of the ship was still intact, and the cannons had been securely lashed to the deck. Trapped beneath the hull and bound by powerful ropes, many of the guns had to be abandoned. Warwick’s guns lay waiting for three-hundred and sixty years. In 1979, they found new life. 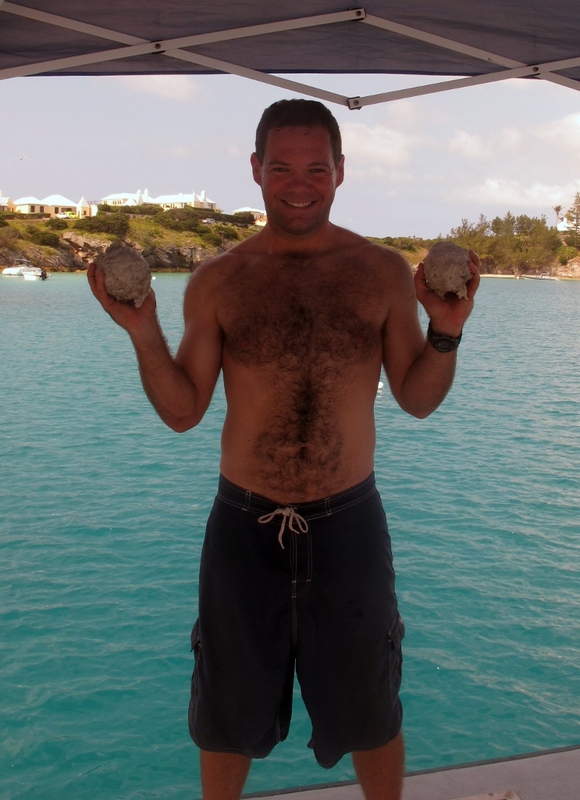 Over the course of several years, famous Bermudian diver Teddy Tucker excavated the stern of the wreck, finding numerous clues to how Warwick was armed. The team from the Philadelphia Maritime Museum raised three guns, a variety of shot, a brass cannon touchhole reamer (similar to that found aboard the Dutch ship Batavia, wrecked in 1628), and a rectangular gunport lid (roughly half-a-meter square). Some of these artifacts can be viewed at the Bermuda Underwater Exploration Institute (BUEI) and at the National Museum of Bermuda. I’m a real fan of the fiction of Patrick O’Brian (admittedly set a bit later than 1619), so this is fascinating. Although “Master and Commander” is set some 200 years later, Jack Aubrey expresses some nostalgia for the old days of sail. If memory serves me right, I recall his first brig Sophie had a pleasing archaic look about her, and crew looked part of a bye-gone age. I think Patrick O’Brian was trying to reach back into the past a bit. Regardless of the date, it is incredible to touch these ships. I hope to have a lot more history posted as time goes by. 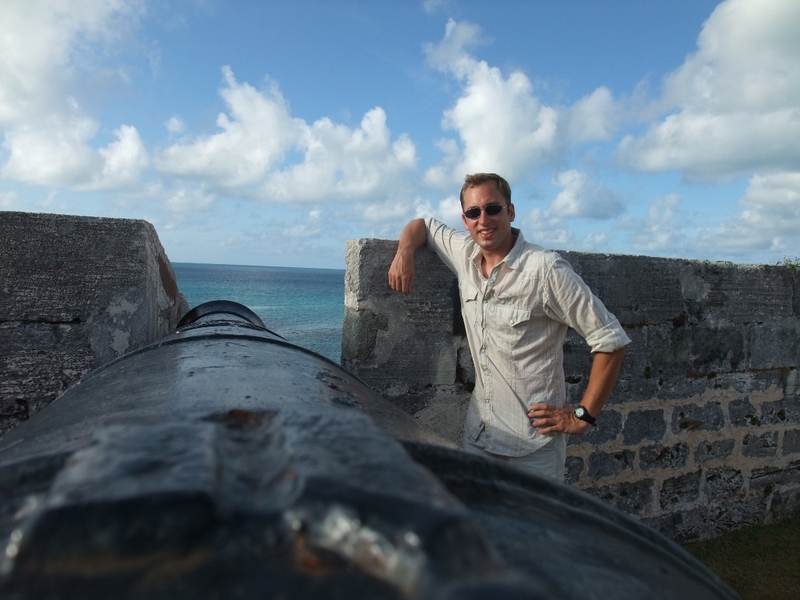 At this time, Bermuda was a exciting place, hanging at the edge of empire. You can still feel it when you walk about the island. The Bermuda Maritime Museum is in an old fort, and a rich experience if you ever get a chance to visit. I’ve never been one for archeology but I’m actually pretty entertained by yours posts so far. keep up the good work. What a compliment! Making archaeology accessible is what we are trying to do. Far too often, our work gets tucked into dusty volume, filed away on a government shelf. We are glad to have you excited! 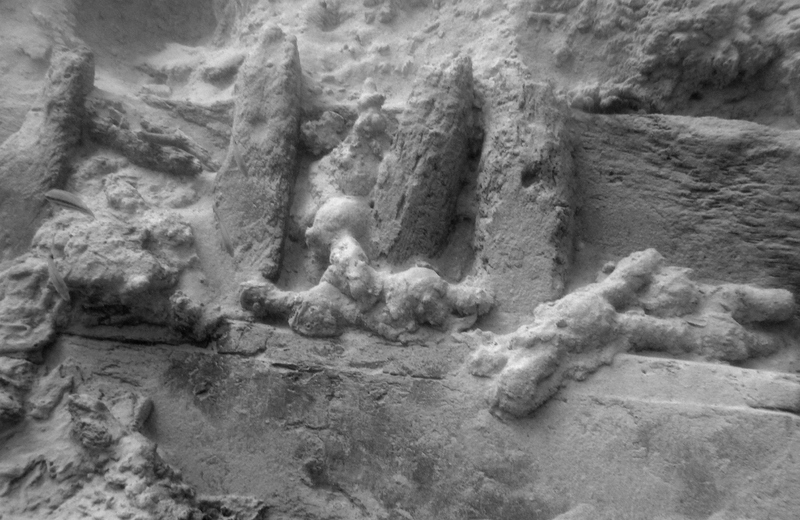 On cold, dark, New England winter nights, I pretend that I am doing archeological work in the warm waters off our coasts….thank you so very much for giving me something to dream about! Bermuda suffers some chill winds in the winter. The directors of our project live at the Bermuda Maritime Museum – and a year ago they lost the roof off their house in a hurricane. However, in the summer, the weather is really ideal. When we arrive in may, it is a bit brisk, but you do not even really need a wet suit by August! I love diving there – and will post many more warm water photos! So facsinating Doug, love read about these projects. Thanks so much for checking them out – we appreciate you following along! Archeological diving is an area I definitely have an interest in. Good work guys! I did not even know that archaeological diving existed in any real extent until a few years ago – I was into high altitude archaeology. When I found out about underwater archaeology, I knew instantly that this was what I wanted to do. Being at Texas A&M really opened my eyes. If you are interested in following other project, there are a number of blogs at http://inadiscover.com/blogs/. Reblogged this on Warwick, 1619: Live Shipwreck Excavation.